Hungry Holler Art Refuge is 12 miles equidistant from the grocery store (Reasor’s in Langley) and Wal-Mart (Jay), with Grand Lake O’ the Cherokees smack dab in the middle of everything, not just geographically. I turn left out of the driveway to go Reasor’s, right for everything else. You learn to make do when it’s a hassle to run errands. And pizza delivery, forget it. When I visit kith and kin in the big city, we order pizza. It actually comes to your door, HOT. Pizza is a good thing. 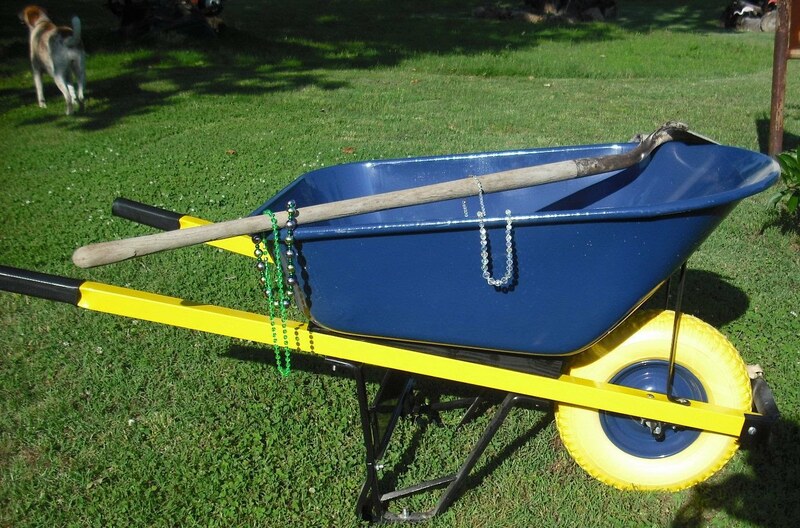 Wheelbarrows are a good thing; both are dependent on the quality of components. I can deal with a mediocre pizza especially when it comes magically to the door. I’ve dealt with all kinds of wheelbarrows. I’ve bought them at yard sales, knowing pretty much from the get go why they were for sale. Wobbly? OK. Dented to hell? Adorable in a wheelbarrow, shows it’s been faithful and a hardworker. The last couple I bought brand new had plastic trays (wheelbarrow speak for the body). 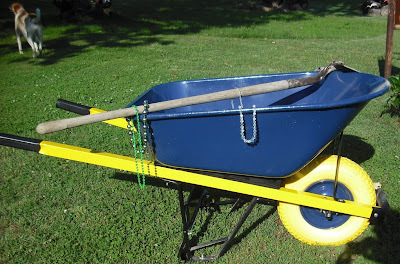 Wheelbarrows play tough at the Holler so I had misgivings, but I didn’t pay much for them and I consider them Bics. Hauling rocks is one of my constant chores for purposes aesthetic and mundane. I pretty quick got a big ole crack right down the middle of one. The thing I cannot abide is the tires they put on wheelbarrows: they’re pneumatic which means they’re full of air, which means they’re never full of air when needed. It’s irritating as the devil. You’ve got a head of steam going, got rocks needing hauled, compost moved, sand distributed, and the damn tire is flat as the fens of Holland. * Or flat as John Deere riding mower tires. That’s a whole nuther piss off. Pneumatic tires on working stuff is just stupid. So I pay 60 bucks for plastic wheelbarrows and another 30 or so to buy solid tires for them. Seriously. I’m pretty sure I paid about thirty dollars for tires. I mix concrete in an old beat-to-pieces steel wheelbarrow. It has served me well and I’d still use it if it had a tire, pneumatic or otherwise. I’ve been dragging it around where I need it, propping it up on a brick to make it semi-level. I move sacks of concrete to it in the cracked plastic wheelbarrow…I can’t bear to continue. 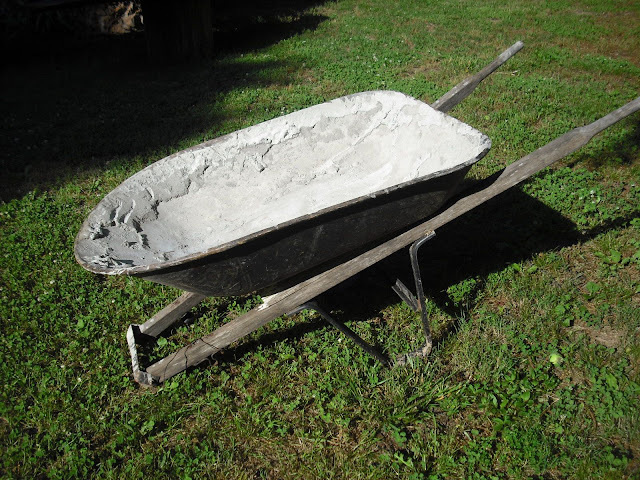 My wheelbarrow need is righteous and at this stage of the game, I want a damn good one. I went to Jones Hardware in Ketchum and spent 100 dollars for a beautiful blue one. What sold me and drove to me spend a hundred dollars on a wheelbarrow without blinking? 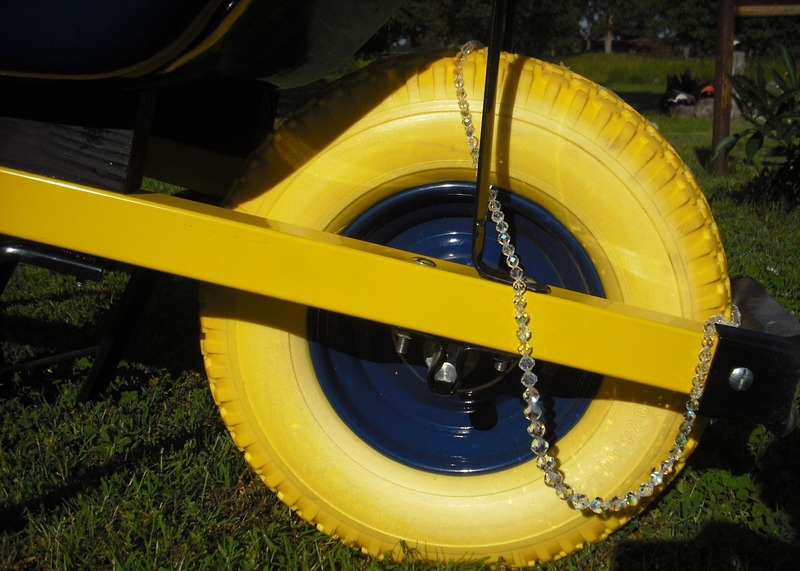 A non-inflatable tire, and it was yellow. 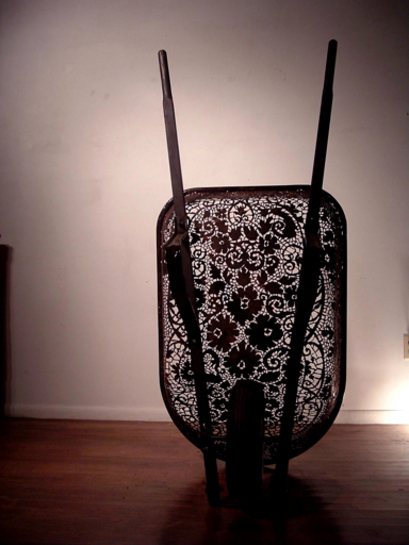 The wheelbarrow was invented by the Chinese. 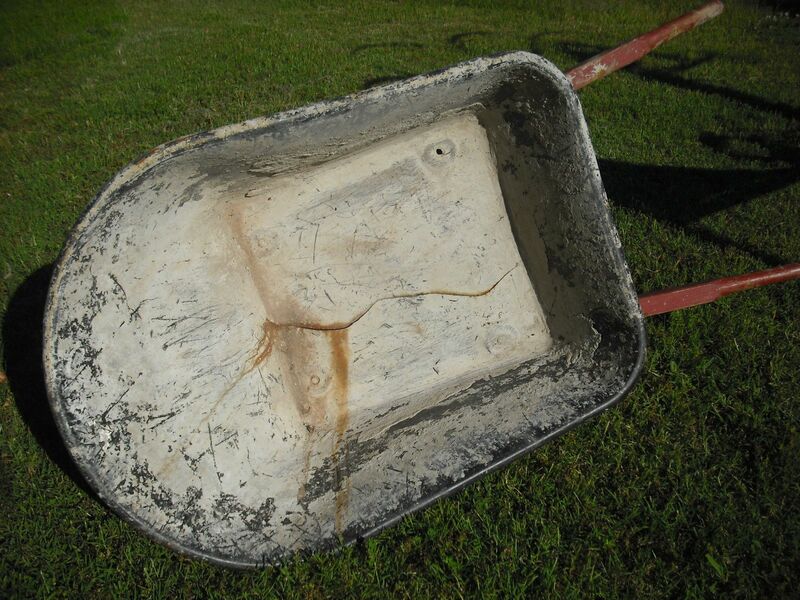 The wheelbarrow was invented by the Greeks. Either way, it was a long time ago. Neither used pneumatic tires. Chemistry eggheads find this wheelbarrow molecule amusing. If you do, click on the link for more hilarity. The wheelbarrow as art pure and simple, by Cal Lane. Check out her other beautiful work. *I didn’t know what that meant. If you don’t, click on this link for enlightenment. Fun. I totally agree with you on the pneumatic tires. I have them on a dolly, radio flyer wagon, and a garden dumping wagon. They are always flat, and won’t hold air for even 20 min. when pumped up at the tire air machines. I’ve threatened to go to the auto tire repair place and see if something can be put into them to stop their leaking or . . . . . . It pisses me off too ! The Calvary arrived with good news. Bro was just here and I asked him about my pneumatic tires, and he told me that he had tubes put in his here and it was only about $10. And that stopped the air leaking. He said that gunk that one puts in the tires doesn’t work. The place that he had his done was at 15th/Yale (in Tulsa) a tire place. It’s over across the street from the old Driller stadium on the Fair Grounds. Soooooo, I have about 10 tires that need that service, and I’m always needing my dolly with the flat tires ! NOT TEN TIRES!!! SIXTEEN STUPID PNEUMATIC TIRES!! OMG, would you believe that I miss-counted on the funky pneumatic tires that I have on stuff here. The total is not l0 but a whopping 16, yes you read it correctly 16 of those turkeys that will need tubes. I took my expensive USA made 2 wheel dolly into Bill’s Tire Service today and had tubes put in those worthless pneumatic tires. The completed job looks good and it was $10. per tire. Now it is comforting to know that I only have 14 more to do ! Bro called today and said that he had bought a product called “Slime” at Atwoods for tubeless tires and that is was working so far. Said also Wal Mart sells it. I still am going to stick with putting in tubes, even though it may be more costly. I trust them, as I grew up with tires with tubes. Tires are supposed to have tubes from bikes, etc.